An issue of the Free Soil Union newspaper, Ludlow Vermont, dutifully chronicled the newsworthy events from the previous day—Sep 13, 1848. Joseph Austin had drowned after falling off a bridge at two in the morning. (He was fishing they said). George Horsey had been jailed for attempting to kill his wife with knife and gun. And Phineas P. Gage, 25, a railroad construction foreman, had met with an accident over in Cavendish. Gage was using a tamping rod to pound sand into a hole filled with explosive powder when a premature explosion sent the rod up through his cheek, into his brain and out his skull. The rod, (over an inch in diameter, over three feet long, and weighing more that 13 pounds), landed 25 yards to his rear, ‘smeared with blood and brain’. Taken to town, Phineas said to the greeting physician, Dr. Edward H. Williams, “Doctor, here is business enough for you.” Williams recounted a man who was tired but alert. He witnessed Gage throw up, the force of which extruded a teacupful of brain that dropped to the floor. Image of Gage discovered on Flickr as anonymous person. From Smithsonian site. As dire as this sounds, the newspaper reported, “The most singular circumstance connected with this melancholy affair is, that he was alive… and in full possession of his reason, and free from pain.” His friends had procured a coffin, but after ten weeks of care by the town doctor, John Martyn Harlow, he went home to Lebanon, NH and lived another twelve years. He had the good fortune to be attended by a ‘country doctor’ who, as a graduate of Jefferson Medical College, was trained to do his best, even when faced with the unexpected: in this case, a profound neurosurgical trauma that turned into a brain abscess. Harlow would chronicle Gage’s post-trauma life, and made much of the ensuing personality change, “transforming Gage into an untruthful, short-tempered, psychopathic, braggart.” We will return to Dr. Harlow in a bit. Gage had undergone an accidental left frontal lobotomy. Harlow’s explanation of the personality change was poetic: “the iron passed through the organs of Benevolence and Veneration, which left these organs without influence in his character…” These were notions characteristic of 19thCentury phrenology. Historical localization of the Gage case in the context of phrenology is nicely done in an article by Barker in the Journal of Neurosurgery. How might one’s personality be affected by celebrity and the drama of cheating death? This question is submerged in the more patent issue—what is the relationship between brain structure and personality? Is it localizable? Alterations in brain geography, the sine qua non for investigation, can be either accidental, (think arrows and rebar and tamping rods), or incidental, as with the grotesque practice of therapeutic lobotomy. Frontal lobotomy has fallen into disrepute. But in the mid-nineteenth century, it was used to treat insanity. Twenty-thousand such ‘psychosurgeries’ were done in the United States. Moniz won the Noble Prize for his role. Retrospection led to a popular notion that Gage’s personality change, especially a reduction in self control, was consistent with that seen in lobotomy patients. One who is somewhat circumspect about the arc of Gage’s personality through time is the psychologist MacMillan, who is, arguably, the worlds leading authority on Phineas Gage. His award–winning book, An Odd Kind of Fame: Stories of Phineas Gage, was published by MIT Press. His online tutorial is exhaustive and entertaining (it is maintained by The University of Akron, (with which he is not otherwise affiliated). Exploiting Gage’s mishap for scientific purpose has proven difficult, and controversial. What was the exact location and extent of the injury? What do primary sources tell us about his baseline and post-trauma personalities? The use of models to reconstruct the injury and textual historical analysis have not resolved the controversies, either of the Gage case in particular or the general concept of anatomic location of personality. But the strange case of Phineas Gage endures as one of the most anatomical curious. For Mütter Museum fans, the Harvard Warren Anatomical Museum will also be of interest. Harlow was grateful to Professor Bigelow for bestowing upon him the credibility that comes with an invitation to speak at Harvard, and this at a time when Harlow was accused by many of fabricating the whole thing. Harlow had followed the peregrinations of his former patient. When Gage died, he got permission from the family to exhume the skull and gave it, along with the notorious tamping rod, to the Warren Museum. Life mask and skull. Warren Museum. We now circle back to Philadelphia Medicine, the prestigious Jefferson Medical College and its renowned surgeon Dr. Joseph Pancoast. 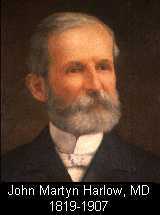 He served as Chairman of the Department of Surgery and Department of Anatomy for over thirty years. Early on in his tenure, one awe-struck class of students witnessed him perform a trepanation* for a brain abscess. The patient improved for a while. But on autopsy it was discovered that scar tissue prevented the intended therapeutic drainage. Professor and students alike learned from the pathologist that in such cases, the wound must remain open for a while. Dr. Harlow dealt humbly with the fame that befell him with the Gage case: “I can only say ... with good old Ambroise Paré, I dressed him, God healed him.”Perhaps providence had intervened much earlier. Seated in the surgical amphitheater when Pancoast operated on a brain abscess, the case with the post-mortem lesson to be learned, was the young John Martyn Harlow. Gage’s injury facilitated natural drainage—and Harlow made no effort to close it up. Which is undoubtedly why Gage survived, and why you’re reading about both of them today. Harlow’s original report to Boston Medical and Surgical Journal is available as an open source Google-digitized document on the Hathi Trust web site. You can visit a memorial to the accident in Vermont, or listen to the namesake band[ https://phineasgageuk1.bandcamp.com] ‘Phineas Gage’—If you want. Or, you might stumble upon The Warren’s Occult Museum in Monroe CT, as featured in Atlas Obscura. You won’t be disappointed there, but that’s the wrong Warren Museum. The Warren Anatomical Museum, at the Countway Library of Medicine, Harvard. (named after the founder of the New England Journal of Medicine and the first Dean of Harvard Medical School), has page on Phineas Gage, which depicts two of their holdings: a life mask of Gage, and his actual skull. You can find the the book An Odd Kind of Fame: Stories of Phineas Gage, Phineas Gage: A Gruesome but True Story About Brain Science and books on the history of medicine via our Amazon affiliate links.